METAR, Joseph - Of Burton, age 74, died Wednesday, January 13, 1999 at IHS of Michigan-Riverbend Nursing Home. Funeral Mass will be held at 1:30PM Saturday, January 16, 1999 at St. John The Evangelist Church, 404 Dayton St. in Davison, Reverend Fr. Andrew Czajkowski officiating, with military honors performed by Davison VFW Post #4087 after the funeral mass. Private burial at New Calvary Cemetery. In lieu of flowers, contributions may be made to the American Diabetes Association. Mr. Metar was born in Flint, MI on July 20, 1924, the son of Ivan and Maggie Metar. He resided in the Flint/Burton area his entire life. Mr. Metar served in the 508th Parachute Infantry Regiment of the U.S. Army during WWII. His distinguished service in Holland and France awarded him the Purple Heart, Silver Star and Bronze Star medals of honor. Mr. Metar retired from A.C. Spark Plug in 1978 as a Toolmaker. Surviving are: 3 children, Connie and husband Mike Quinn of Davison, Nancy and husband Mark Zbiciak of Davison, John and wife Thuy of Honolulu, Hawaii; 4 grandchildren, Amy and Scott Quinn, Monica and Nicole Zbiciak; sister, Mary Marinovich of Flint; numerous nieces and nephews. He was preceded in death by his parents and brothers, George and Nick. The family wishes to give special thanks to the staff at IHS of Michigan at Riverbend and IHS Samaritan Care Hospice of Michigan. 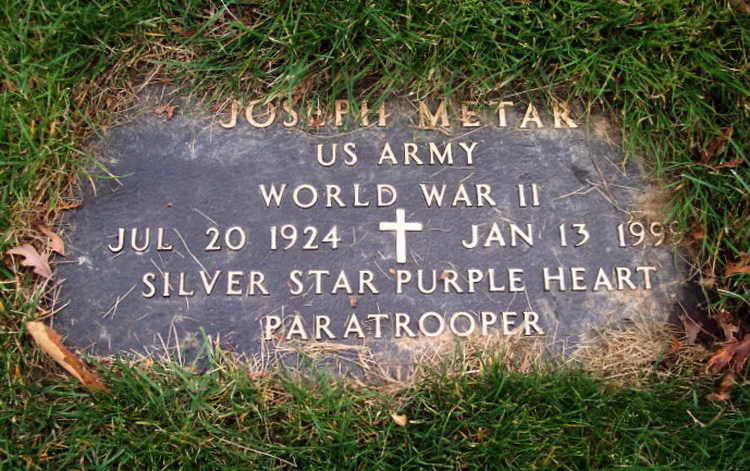 Grave marker for Joseph Metar in the New Calvary Catholic Cemetery, Flint (Genesee county), Michigan. Joseph enlisted in the Army on 13 February 1943. A parachutist volunteer, he was assigned to Company G, 508th PIR. He was awarded the Bronze Service Arrowhead device for participation in Normandy assault and he also jumped into Holland where he was wounded on 26 October 1944.